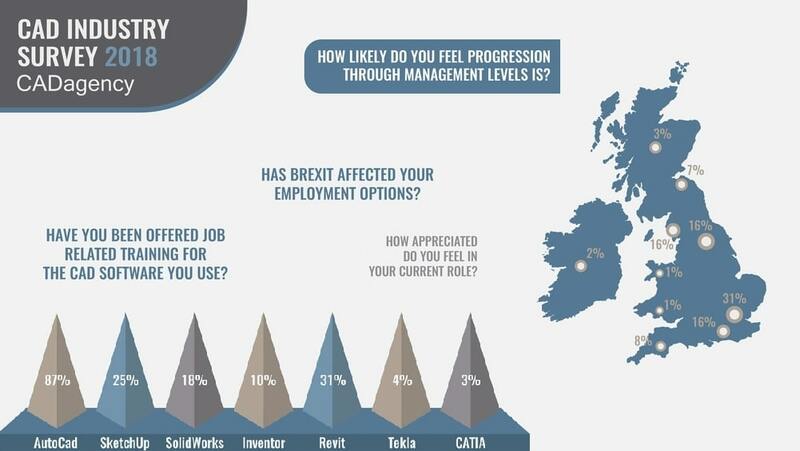 The latest results from the CADagency Employment Survey reveal intriguing new insight into changing attitudes on career rewards, job satisfaction, and Brexit. Based in Manchester, CADagency has rapidly developed into one of the UK’s leading specialist recruitment agencies, providing employment solutions for jobseekers and companies in the architectural and engineering sectors. Established in 2013, the agency has since expanded into further professional recruitment areas including surveying, interior design, commercial kitchens, and product and packaging design. Over the last six years, CADagency has conducted an epic annual survey in which the company’s clients are invited to share details of their current salary, career progression hopes, key incentives for changing jobs, and much more. And no, this is not a Brexit-free zone. This year, as you might expect, the clients are also asked if Brexit has made any impact on their employment options. CADagency has just published the results from the 2018 Survey, taking the opportunity to analyse the fresh data and compare it with previous surveys to pick up on changing trends and feelings within the industries. There are certainly a few surprises and twists that were uncovered along the way. Firstly, let’s get Brexit out of the way. While Brexit may be dominating the business headlines and casting a dark shadow of uncertainty over many of the UK’s industries, it so far appears to be having little impact on the respondents of this year’s survey. CADagency itself reports a substantial growth in workers and companies signing up to the agency and collaborating on a higher number of successful projects rooted in architecture, engineering and design. The previous year’s survey did see a dramatic drop in younger people aged between 18-24 working in the industry, which led to speculation that fewer young Europeans were choosing to locate to a UK in the grip of Brexit turmoil. However, this year’s results show an encouraging rise back up in the right direction, and in fact only 22% of all respondents claim that Brexit has affected their employment options at all, with a healthy majority of 78% reporting that Brexit has so far had zero impact on their career. One of the more intriguing revelations to emerge from the data is the clearly shifting attitudes towards job-change incentives. It shouldn’t come as a major shock to anyone that the most popular incentive for changing your job continues to be the prospect of a higher wage, and this is unlikely to change any time soon! But the really interesting trend shift over the years is the bigger attraction towards more flexibility in working hours. Going back to 2015, only 43% of respondents chose flexible working hours as a top key motivator for changing employment, but this has gradually increased to the current high of 54%, suggesting that a growing number of workers are becoming more interested in developing a healthy balance between work life and personal life. Pension prospects are another rising key motivator, reaching 19% for the first time this year, which seems to indicate that employees are becoming more prudent and far-sighted about the longer-term rewards of working in the industry. The full survey results and data analysis from the Manchester company also delve into changing trends in salaries and how they stack up with the general rise in pay growth in the UK, along with fresh insight into the shifting hopes of career progression and the levels of job satisfaction felt by the survey respondents. Check out the survey in full here or visit the main CADagency website to learn more about the specialist recruitment company.